It [the Quran] is only an oral tradition. It’s not written. People at that time wrote what they heard, but the Quran itself is not Quran unless it is heard and spoken. That is what it means – Quran, that which is recited. As a matter of fact, as we discussed in other programs, “Quran” is not really meaning a book, in the sense that it’s this book here [pointing to a mus-haf], but rather the book that’s with Allah, and when it’s recited it’s considered “Quran” – that which is being recited. Source: “Preservation of Islamic Resources,” part 1 of 4, produced by Huda TV (2008) from the series called, “Beauties of Islam.” On YouTube here at precisely 6:35 to 6:50 (uploaded on July 16, 2009). The word “Quran” in Arabic does not mean a book. The word for book in Arabic is kitab. Although we refer to the kitab of Allah, meaning the Book of Allah. When we speak of “Quran” it actually means that which is being recited. You can not hold Quran in your hand because you can not hold a recitation. This is in your throat, or in your heart, or in your mind. You can hold the book that represents it, but in Arabic that’s called fus-haf, or the mus-haf. This is the scripture of Islam. Source: “Miracles of Muhammad” produced by Islam-1.net (2006). On YouTube here at precisely 3:30 to 4:10 (uploaded on March 1, 2012). 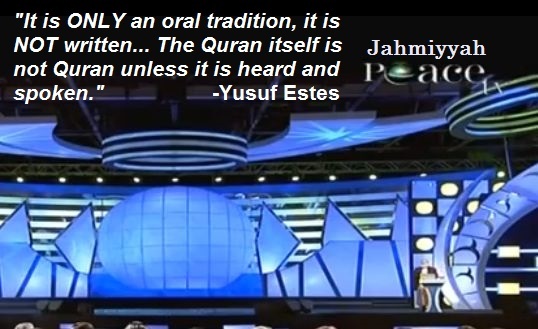 Yusuf Estes clearly states here that the Quran is only the recitation, and that what is written in our mus-hafs is not the Quran. This is a serious violation of the basic Islamic belief that Ahlus-Sunnah hold by consensus, based on the clear understanding of the Prophet (may Allah raise his rank and grant him peace) and his honorable Companions. During that time and ever since, this event is referred to by the Muslim scholars as “Jam’ al-Quran”, or the compilation of the Quran (into one mus-haf). This concept propagated by Yusuf Estes on Huda TV, Peace TV, GuideUS TV, and others is a very dangerous error, something considered by our early scholars as a statement of apostasy, as seen clearly in the above quote from the words of Imam at-Tabaree. Tafseer - Yusuf Estes explains the Quran (85:22) "In a Preserved Tablet"
The Dusseldorf 1250 Con: Yusuf Estes Works "Miracles" in Germany?